Let’s take a nostalgic walk back to the 70’s to St. Louis City. The cops who trained my dad were “old timers” from the 40’s who thought nothing of using old school ways to treat crime. Oftentimes, apparently, (and this is by no means a testimony of guilt but just a simple blog based on oral tradition and meant as a walk down ole memory lane) just vanished and crime disappeared in certain areas. Ah, the simple days. No milk mens’s wares went missing that’s for sure. SLPD squad car and paddy wagon. My dad worked the 9th district. The 1930’s Art Deco building that housed the cops was situated among some tough neighborhoods and it wasn’t uncommon for the cops to dodge a few bullets leaving their squad cars. Eddie, the Station Manager was from out East and had the accent to match. Allegedly, he took hourly walks to the break room to refill his mug with anything but coffee. The man never missed a beat despite his love for….coffee. My dear ole dad worked one of the toughest districts. 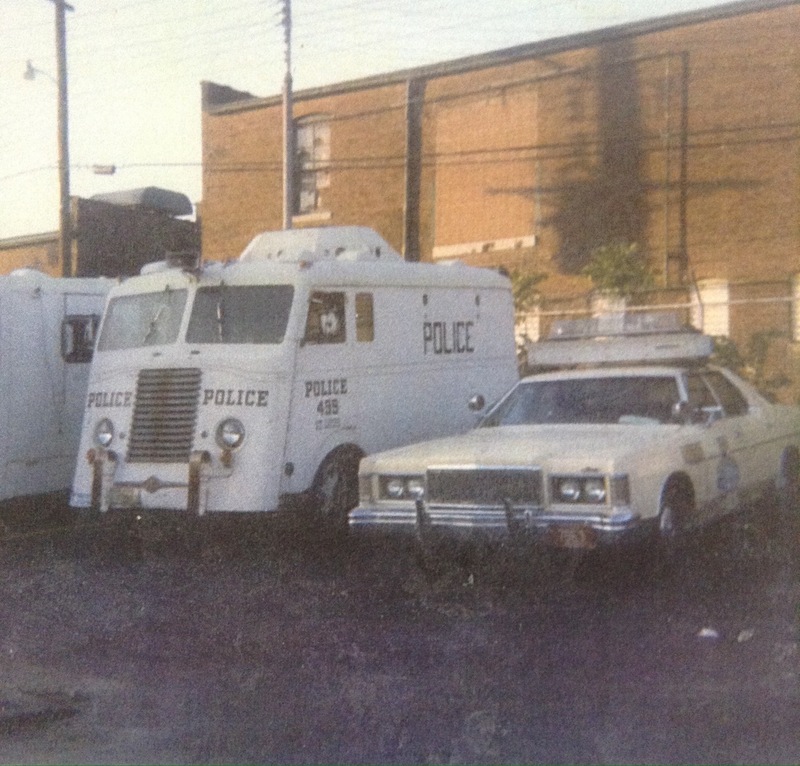 He said that the squad cars didn’t have time to cool off before they were out rolling again. Cops in this district didn’t get many chances to eat because as soon as they finished one call, they were racing to their next. His partner then, and best buddies never wore a seat belt. He wanted to always be ready to jump to out of the car. They also ode with their windows rolled down even in St. Louis’ sweltering summers. Why? He said you had to be able to talk to people immediately, to find out what was going on in the neighborhoods, to be able to respond to anything at anytime. 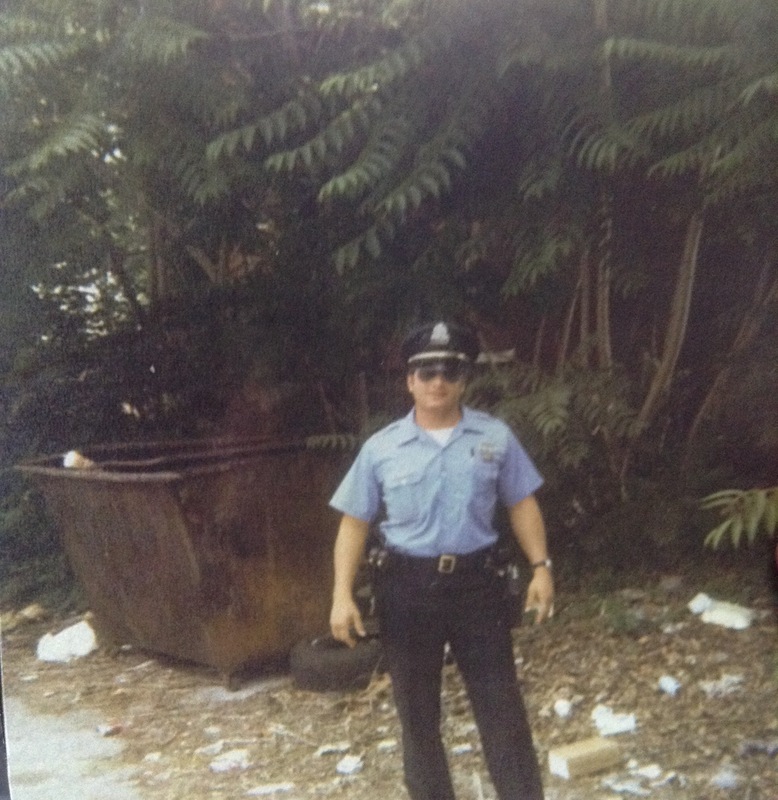 My dad on duty in the 5th district. 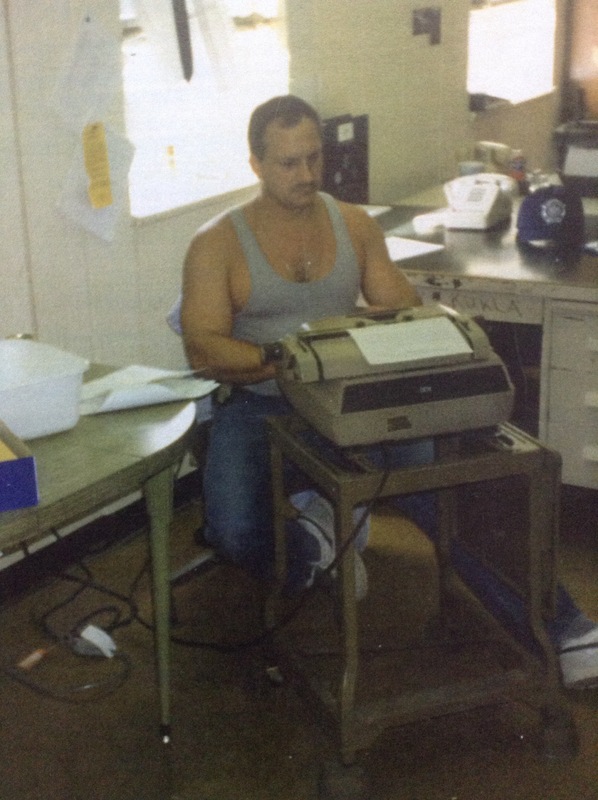 When my dad wasn’t working as a cop or off duty cop, or a side construction jobs, he occasionally took me to pick up his check. This meant one-on-one time with my dad and a trip to the 5th district station. Art Deco spoke to me even as a child. We parked by the other cop’s civilian cars just several spots away from any unused squad cars. Most were out on patrol. Inside, several men would be in holding. They met my eyes. I saw anger and despair. Deeper in the building were desks, chairs, and type writers. Stale cigarette smoke mingled with burnt coffee and gunpowder. I touched nothing and I spoke to no one. Usually, as we left, my dad would grab a St. Louis Police Department pen etched with, “St. Louis Police Department” on it and a flip burnt orange notepad for me as parting gifts. I didn’t use these treasures because I wanted them to keep forever. St. Louis City was considered one of the toughest cities in the country with a high murder rate along with high crime rates. We were going through mob wars. As it turned out, out we ended up moving next door to a key player in these wars and who ended up to be the 1st person executed in the state of Missouri since the 40’s. That’s an entirely different set of stories though. People died. Mind your business was and still is the mentalityin St. Louis. After shifts, cops hung out, lit a fire in an old barrel an imbibed on…uh, coffee to destress. After a long shift and usually putting in overtime, this meant they were home even later. Coupled with the stress of the profession, it’s no wonder that cops tended to get divorces. My dad commented that he couldn’t handle 8-10 hours of pure adrenal rush and then just stop. He had to unwind. The guardians in blue patrolled the streets and those who loved them watched longingly from a distance.